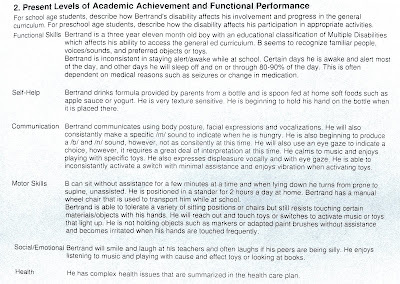 Bertrand's Individualized Education Plan (IEP) was revised today. He's come a long way from his first IEP last year. Annual Goal 1: Bertrand will sit with supervision during circle time. Annual Goal 3: Bertrand will tolerate a variety of textures to participate in structured group activities and play. Annual Goal 4: Bertrand will stay awake/alert for 4/5 classroom activities throughout the school day. Annual Goal 5: Bertrand will demonstrate anticipation of upcoming events when presented with a touch or object cue. Annual Goal 6: Bertrand will indicate a choice among two preferred items. 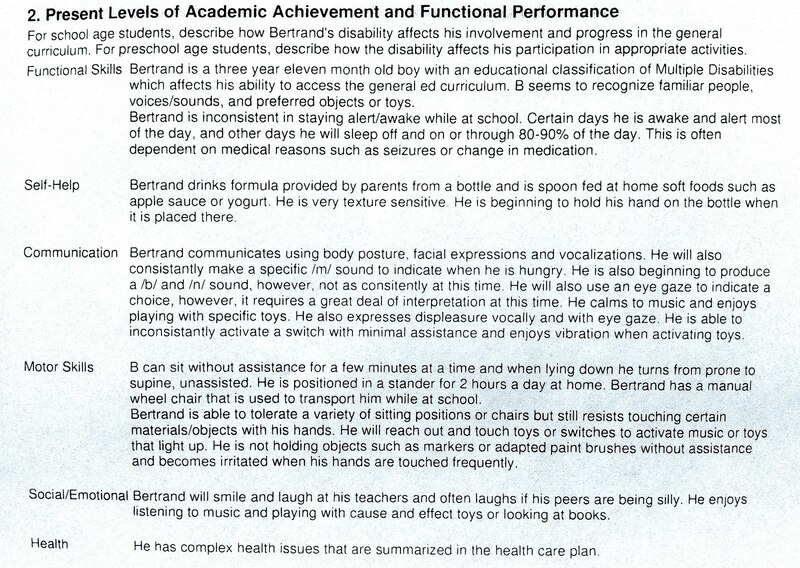 Annual Goal 7: Bertrand will use a switch to consistently activate a toy or object without adult assistance. Annual Goal 8: Bertrand will indicate "done" or "finished" to complete an activity 50% of the time. Looks like 'long way' progress to me! Congrats to you all!